Ransome Attachments has signed an agreement with UK-based Exac-One Ltd. to become the first distributor of the Grab-N-Drive post driver in the United States. The connection was forged through the Black Splitter, which both firms distribute in their respective countries. Ransome will offer the GD30S initially, although all other Grab-N-Drive models will be available upon request. 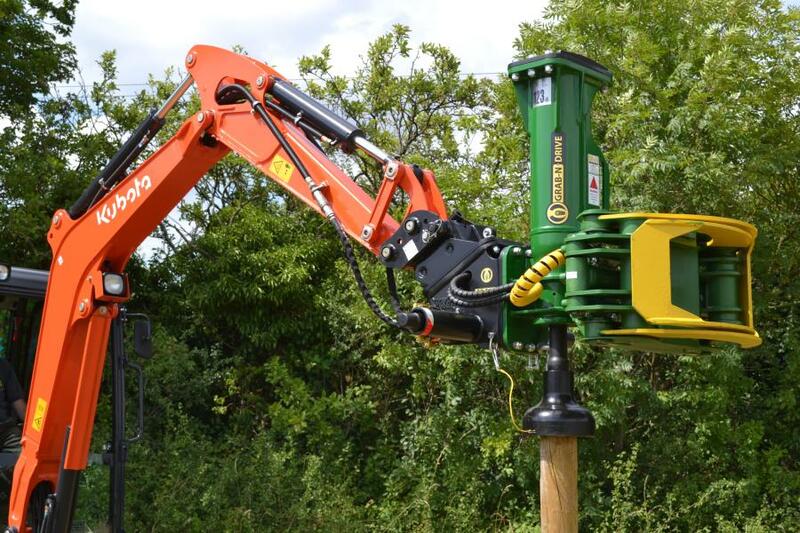 Designed by Exac-One and manufactured in the UK, the GD30S allows an operator to handle, place and drive wooden, concrete and metal posts without the assistance of a person on the ground. The multifunctional attachment consists of a grab to handle and set posts and a hammer to drive them. The hydraulic GD30S can deliver as many as 1,250 blows per minute (bpm) at up to 502 foot-pounds. The GD30S, like other attachments offered by Ransome Attachments, is designed to allow a single operator to improve productivity while reducing the need for additional manual labor. "Our goal is to find multifunctional attachments that can improve profitability for our customers by streamlining their operations," said Owner Eric Ransome. "The Grab-N-Drive was an obvious addition to our lineup." The Grab-N-Drive can be fitted to excavators from 1 ½ to 14 tons within minutes through the use of an interchangeable mounting bracket. It also is possible to remove the grab and install a top-mounting bracket, allowing the breaker to be used in a traditional manner for breaking rock and concrete. Ransome also will be offering a special universal adapter plate to allow the GD30S to be used on skid steer and tractor loaders. "The enormous response from the United States to our Grab-n-Drive on social media, along with a significant number of direct sales to American customers, convinced me that this market wants, and needs, the Grab-N-Drive," said Exac-One Owner and Sales Director Andrew Harker. "I'm really excited that we have linked up with Ransome Attachments who will be working as our distributor partner throughout the U.S."
Click here to learn more about the Grab-N-Drive GD 30S post driver.